"You were the perfect touch to our wedding day." E.F., Philadelphia, PA.
"The compliments about your music are still coming in." G.A., W. Long Branch, N.J. I just wanted to write a quick note to say thank you so much for doing such a beautiful job at our wedding. The ceremony was amazing and everything I could have asked for. Each song was more beautiful than the next. So thank you for making it all go so well. "Everyone raved about the music. And it really set the tone for the most wonderful day of our lives. Of all the decisions we made, choosing you was the best!" A.B., Rumson, N.J. The phone has been ringing ... and your names have been high on the list...During the Mass the music did exactly what I had hoped for ... it emphasized the solemnity and beauty of the occasion. It elevated the mind and heart complimenting the prayers of the Mass. I loved it! No one has mentioned the wedding without saying how impressed they were with your music. For, the less aesthetic, it was very "classy"! Your music...will be a long remembered and very cherished part of the day. 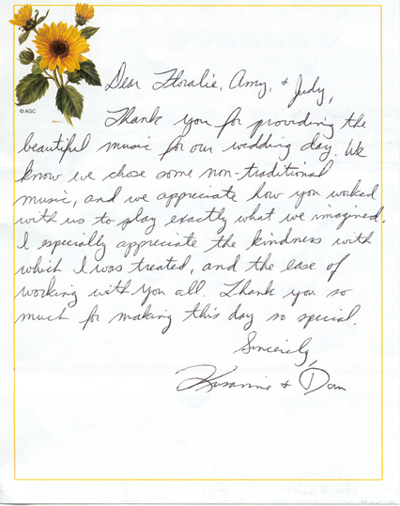 "We wanted to thank you so much for the magnificent job you did playing at our wedding at Temple Beth Ahm in Springfield, N.J. ...you played so beautifully. You helped make our wedding warm, sophisticated, and wonderful. We will definitely recommend you to everyone we know." 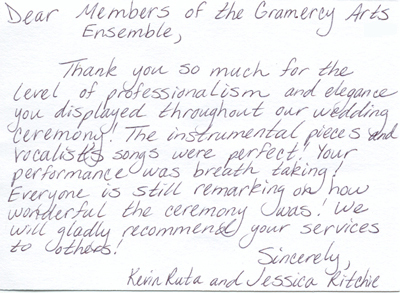 H.G., New York, N.Y.
"We are blessed to have the Gramercy Arts Ensemble perform for us. They are extraordinarily talented musicians." D.G., New York, N.Y.
"As a patron of the arts, I am so impressed with the tremendous impact your group presents. Your sound is exquisite." A.S., New York, N.Y.
"Everything was so well planned, your selections were wonderful." P.S. Monmouth Beach, N.J.
"You were terrific! I can't tell you how everyone was (and still are) raving about you...You are all so talented." R.H., New York, N.Y. In the whirlwind of excitement of our daughters wedding last week, we feel terribly remiss that we did not find the opportunity to thank you personally for your magnificent music. Your performance, from the prelude to the ceremony to the cocktail hour, was exquisite! Our family and guests were moved by the music you made and we have had many people remark on how wonderful you were. 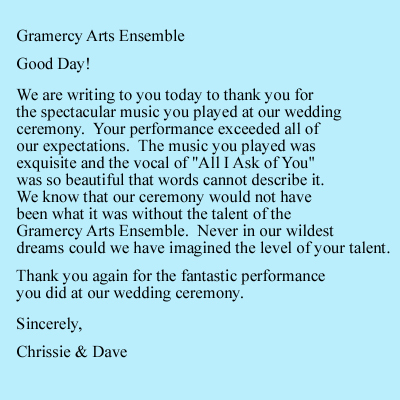 We are especially grateful for your willingness to adapt and perform the Mozart wind serenade for the processional and the aria for the ceremony. You truly personalized the ceremony for us and we are most appreciative of the extra work this entailed. You have been with us for the two most momentous celebrations of our family – David’s Parents’ 50th anniversary celebration and our daughter’s wedding. Each time you have added elegance and beauty and have touched our hearts with your music. 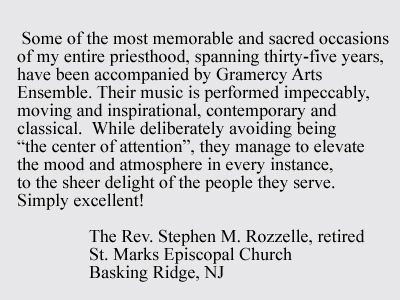 Following our musical participation in a Catholic Mass, the father of the bride described his overwhelming emotional feeling when he said to us,"...your music made the Mass so beautiful, I didn't want it to end!"